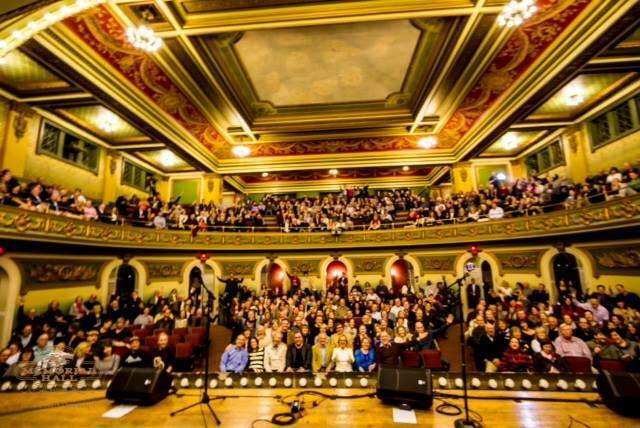 A 600 person, full capacity crowd at Memorial Hall poses for a "selfie" during a recent "Blues & Brews" event. Over-the-Rhine's historic Memorial Hall is ready to undergo major renovations. Hamilton County Commissioners today agreed to enter a development agreement with 3CDC to update and operate the 600-seat performance hall. All three commissioners voted 'yes' on the project, which includes a $1.5 million contribution from the county. Original post date: 02/02/2015 3:27 p.m.
Memorial Hall in Over-the-Rhine is poised to undergo renovations if Hamilton County Commissioners sign off on the project. The $7.8 million plan includes restroom, theater and facility upgrades along with installing air conditioning. Cincinnati Memorial Hall Society President Bill Baumann says the project would pay "a substantial dividend for the community." "I think that Memorial Hall has become recognized as an important civic and architectural treasure," says Baumann. If approved, $4.1 million would come from state and federal tax credits and grants. 3CDC and the Memorial Hall Society plan to raise $2.2 million in philanthropy - a one million dollar donation is expected in the coming days - and the county is being asked to front $1.5 million from its general fund reserves. An endowment would be established to fund operations, meaning the county's current $100,000 per year budget line for Memorial Hall would be eliminated after three years. Commissioners may vote Wednesday to move forward with a development agreement. A vote on the funding would come sometime after that.